13/1/19 – At last! Vinnie has found a wonderful new home! 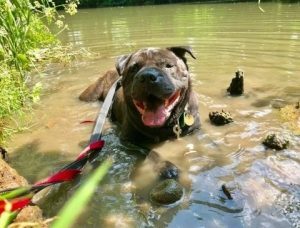 Vinnie the “mini Shar Pei” is brought to you by Rescue Remedies! 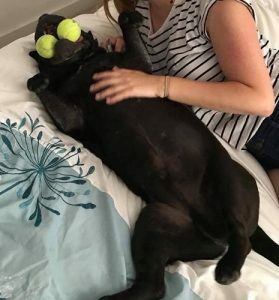 He’s been at their kennels in Guildford, Surrey for a staggering 2 years, ever since his owner sadly passed away. Everyone there loves him but he needs to properly belong to someone. He can live with older children who are steady enough on their feet, for such a substantial playmate! 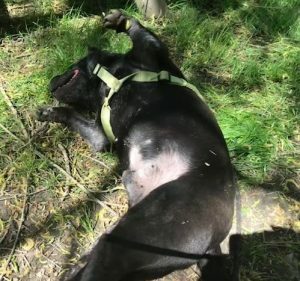 Technically, he’s a Shar Pei X Staffy. 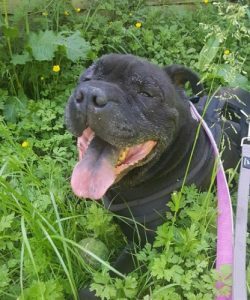 He’s 9 years old and has the Shar Pei wrinkly face and puffy muzzle combined with the Staffy love of everyone! Vinnie wants to be an only pet at home for maximum cuddle potential! He’s generally fine about passing other dogs when out on walks. 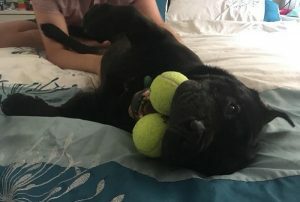 As long as he has his two trusty gob-stoppers and you to protect him, he’ll feel safe enough to go get on with his job… ball transportation. 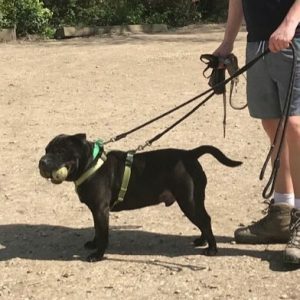 There are plenty more pictures and videos of Vinnie and his tennis balls on his thread on the Rescue Remedies website. 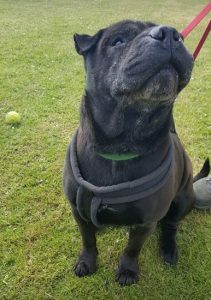 He’s a firm favourite with many of the volunteer walkers at the rescue and one of them was able to give him a week’s respite foster care recently. She said, “He’s been perfect in our little flat, and lets us know when he needs to go outside. He has been sleeping in his own bed on our bedroom floor, and as soon as my alarm goes off and he sees that I’m awake, he hops into the bed for a cuddle and a snooze. 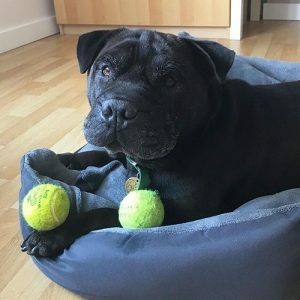 “While he is a little bit older and does enjoy his quiet time, snoozing on the sofa / bed / floor / anywhere, he still has a lot of youth in him, and loves playing catch and running around. He even went out for zoomies one evening! “He does the funniest things that will keep you entertained all day. Instead of getting up to turn around, he will just sit down and swivel on his bottom. It’s hilarious to watch and he looks so pleased with himself while he spins. “Walking Vinnie will make you feel like a local celebrity. I haven’t managed a single walk without being stopped by someone to ask about him – he’s just that handsome! 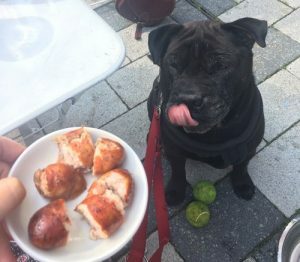 People love seeing him out and about, especially with his two tennis balls. He’s very good with strangers, and will happily stand while he’s being fussed over, or sit down if I have stopped for a natter. 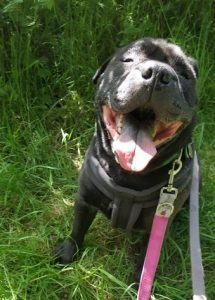 If you can give Vinnie all the cuddles and fun times he seeks, please contact Rescue Remedies by filling in their online homing questionnaire. Please say you saw Vinnie featured on the Oldies Club website. This replaces Vinnie’s original page dated 24th January 2018.